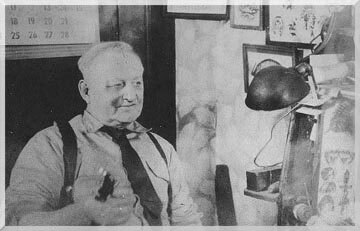 Learn more about the history of tattooing in Pittsburgh and the Western Pennsylvania area! These pages will be updated as pictures and information become available. My hope is to establish an accurate time-line of tattooing in Western Pennsylvania. If you have any information you'd like to share, please contact me via e-mail. Following are pictures of J.G. 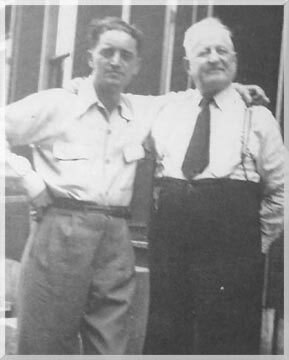 Russell and Sailor Ned Resinol, both worked in the Pittsburgh area circa 1930-1950 (approx). Russell is renowned for his brass machine frames. He used to work in a brass smelting factory on the North Side. Many of these frames are still in use today! Resinol and Russell were obviously acquainted and it's likely that Resinol looked to Russell for guidance and information being the younger of the two. J.G. Russell (right) with a young Ned Resinol. J.G. Russell in his Pennsylvania Avenue studio on Pittsburgh's North Side. Sailor Ned Resinol at his retirement home in Florida taken in the early 1980's. Note the signatures tattooed on either side of the tiger head. They include Pittsburgh tattooers J.G. 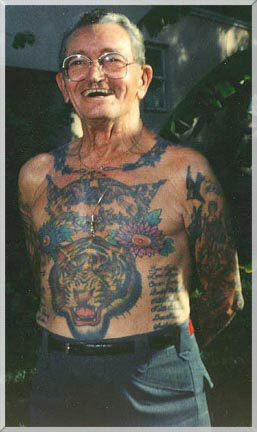 Russell and Fisher along with a host of other legendary old time tattooers!